These warnings are most often directed toward pregnant women, with the intent of protecting the fetus. And, like most health sound bites, turn out to be overly simplified and mostly wrong. Health is more nuanced than “do this” and “don’t do this”, and, as usual, the mercury story told in this country is based on faulty science, perpetuates an incomplete story, and leads to worse outcomes than if the health precautions were completely ignored. Therefore, despite the ever-present cautions, I would highly recommend you consume marine fish and shellfish, especially if you are an expecting mother, so long as you understand a few details. Read on. Docosahexaenoic acid (DHA) is a long-chain fatty acid crucial for human health. It is a fat that can be found in a variety of animal foods and some marine algae, occurring most abundantly in some ocean fish and shellfish. While adults suffer a range of problems when they consume a diet limited in DHA (e.g., depression, Alzheimer’s Disease, age-related cognitive decline), it is the fetal impacts I will highlight here. This fatty acid is necessary for brain development of the fetus and the growing child. Deficiencies in DHA affect intelligence, problem solving, and eyesight. I want to be very clear: low intake of DHA by the mother results in lower IQ scores and suboptimal brain development in children. This fat belongs to a class of lipids called omega 3, which are essential to obtain in the diet because the body cannot manufacture them. Like many essential items we derive from our diet, there are different forms that occur in plants than in animals. This is another case where the plant form (called alpha-linolenic acid, abbreviated ALA) must be converted through a complex process to create DHA. This conversion process is inefficient, and even in healthy adults only 5–10% of the consumed ALA ends up becoming DHA. Further, many factors inhibit this process, including high intake of omega-6 fatty acids, which are exceedingly common in the Standard American Diet and in vegetarian diets. Therefore, it is important to consume preformed DHA—which is the kind found abundantly in many fish and shellfish. But wait, aren’t these dangerous to consume? The United States Food and Drug Administration (FDA) has set guidelines for fish intake by pregnant mothers to protect the mother and, especially, the fetus from the effects of mercury. For decades, these warnings have limited the intake of foods that are an important source of DHA in the diet. But, like the fat and cholesterol warnings, the mercury warnings also turn out to be based on cherry-picked data and an incomplete understanding of the topic. Three major studies occurred in the 1980s, 1990s, and 2000s to ascertain the safety of consuming fish. Two of the studies demonstrated no negative impacts and one of them (the Faroe Islands Study) did. This latter study was used to demonstrate the harm of mercury contamination in fish and establish the warnings we are all familiar with. Because we are a reactive society that responds to fear-based recommendations, the warnings were so effective that a 2010 study found that pregnant women were not eating the suggested number of fish meals per week. There are several pieces of this puzzle that must be explained to help you (the reader) understand why the dietary mercury warnings may be misguided. To begin, mercury is not directly toxic to the body, but instead wreaks its havoc by deactivating very important enzymes that contain selenium. These enzymes—selenoenzymes—function as antioxidants to protect fats and proteins from damage by oxidation. If the body contains ample stores of selenium, mercury cannot catastrophically interfere with these enzymes. In other words, selenium is protective of mercury toxicity. 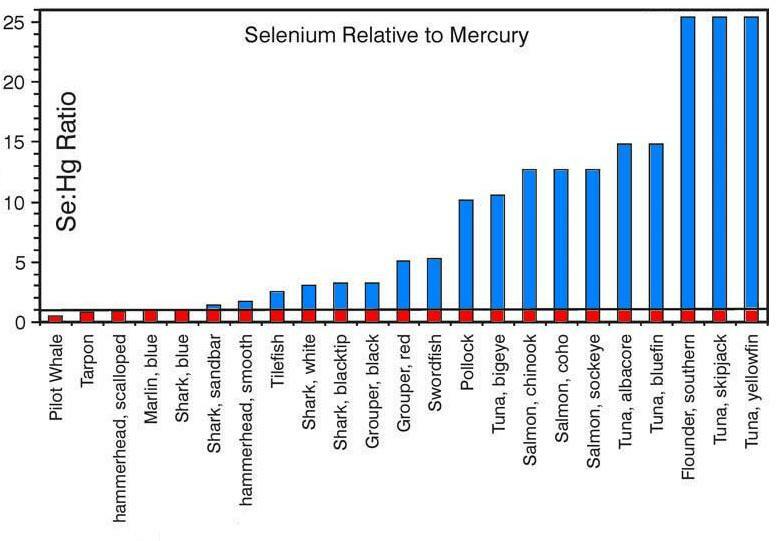 Of importance to this discussion is that many fish and shellfish contain abundant selenium in their tissues (or, put another way, the ratio of selenium to mercury is high). Through providing dietary selenium, these foods are not the danger we have been told regarding mercury. While single fish meals are not the issue here (it is the cumulative selenium and mercury ingested in the overall diet), it is useful to note that some fish, such as shark, contain little selenium compared with the mercury they provide (i.e., the selenium to mercury ratio is low). Therefore, such fish might best be limited without a good intake of selenium in diet. On the other end of the spectrum, fish such as tuna, flounder, pollock, and salmon supply much more selenium than mercury. (Note: plant foods such as Bazil nuts, sunflower seeds, and several grains can also supply substantial quantities of selenium and can be part of the overall strategy to protect the body from mercury in the diet). Now, back to the studies used to demonstrate harm from ocean foods due to their mercury content. The Faroe Islands study turns out to be a terrible study to use for several reasons. Most importantly, the residents of the Faroe Islands were eating pilot whales (genus Globicephala), species that contain extremely high amounts of mercury in its tissues—far too much to be mitigated by the co-occurring selenium. Not to mention, this study had many other confounding issues, including (but not limited to) additional environmental toxins found in the pilot whale that could be responsible for the observed health issues, the study methods themselves, and the genetics of the resident population. Another important part of this discussion that is not addressed by the warnings to limit fish and shellfish is that some foods help to bind ingested mercury and prevent its absorption by the body (the mercury is ultimately excreted during evacuation of the large intestine). This strategy changes the effective selenium to mercury content of the food as experienced by the body. These foods offer another layer of protection from mercury. Two important foods to mention (among several) are chlorella and plants containing insoluble fiber. Examples of the latter include fruits like strawberries, raspberries, and blueberries. These foods are effective at trapping consumed mercury and carrying it out of the body. Chlorella (a blue-green alga) and the insoluble-fiber-rich foods can be ingested in the same meal as the fish and/or shellfish and prevent a large proportion of the mercury from entering the bloodstream. As are often the case, the dietary recommendations supplied to the public in the United States are overly simplified and lack the necessary nuance reflected by the complexity of issues involved. Whether or not a person will experience harmful effects from ingesting mercury in food depends on many factors, including the species consumed, the intake of selenium in the diet, and the amount of insoluble fiber eaten in the same meal. Importantly, the avoidance of foods rich in DHA have consequences, especially to developing humans, that can limit full intellectual development (among other real risks). The general tact in many dietary circles is complete avoidance of foods believed to be dangerous, despite the fact those foods supply critical nutritional elements that may be difficult to acquire in sufficient amounts elsewhere. I suggest it might be advantageous to utilize strategies to minimize the harm from such foods, rather than avoid such foods outright (there is net benefit using this approach). Sustainably harvested fish and shellfish represent some of the only wild foods that can be acquired in the marketplace. These foods that are extremely valuable due to the DHA and selenium they supply, and other items not discussed here (e.g., vitamin D, zinc, magnesium, B vitamins). The story of mercury in fish and shellfish is a good example of what happens when we allow fear to rule our dietary choices. Newer PostIs the Acceptance of Physical Punishment a Symptom? Older Post"But Wild Food Is..."